Gremyo : You are right! I forgot to add the removal cards here in the post ( i had 'em in a different pile). Added Krosan Grip , Reclamation Sage , Viridian Zealot , Acidic Slime , Caustic Caterpillar . What (budget) cards would you suggest to improve the ramp problem? CyborgAeon: Sorry for the delayed response, I appreciate your comment and wanted to spend a bit of time on the response (this was the first time this weekend I've had a chance to sit down at my compuuter). As for the individual cards. I've thought about Natural Order in the past. My biggest issue with it is that as you mentioned, it only fetches green creatures. 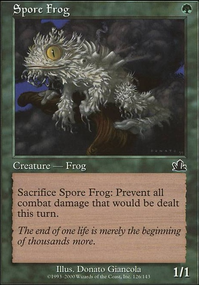 While there aare a lot of good green creatures in the deck, there aren't that many that I would want to spend Order on. Yisan would probably be the primary target and then it feels too slow. I have a variant of the deck which packs Protean Hulk , which would give much more bang for buck. I will add it to the maybeboard there, however I think that here it seems a bit too weak. The topic of hatebears is an interesting one. I have seen a few Saffi lists who employ stax/heatbear effects however have opted to focus more on racing to combo. I know the deck will never be faster than lists with access to blue/black however my preference is to spend card slots on ramp and card draw rather than only having limited draw/tutors due to trying to fit a stax package in as well (not to mention having to waste tutors on finding stax pieces rather than digging for win cons). Along those lines, I do entirely agree that I should make the combo as fast as possible. I do really like your suggestion about Elvish Spirit Guide . I'll add it to the maybeaboard for now, I'm not sure if I want to cut Mikokoro for it however it feels like a good addition to the deck. I was also thinking of adding Voyaging Satyr as well, as it does the same thing as Priest of Titania in the Yisan line. For me, Summoner's Pact falls under the same category as Natural Order . The limitation on it makes it only really good enough if the deck was running Hulk. I do like the idea of Leyline of Sanctity as a meta include. I don't think it's good enough for mainboard however I will add it to the maybeboard (I think it will be worth adding some modular swaps for the deck) and that one seems like a funny idea, especially with Rector. As mentioned, I appreciate the input - there are some solid ideas and I think ESG will end up in the list very soon. It seems strong - though with such an investment in creatures have you considered Natural Order ? I know it only gets a green creature, but you've a slew of reasonable targets. 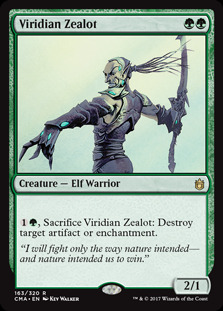 Also Viridian Zealot is a mana cheaper than Qasali Pridemage & it's an elf - making that cheaper. Your lack of hatebears (selesnya's best trait) makes me believe you should consider more speed in your combo. Cutting mikokoro for Elvish Spirit Guide is a good example. Another would be including Summoner's Pact to find a combo piece. My last advice is only that I'd recommend leyline of sanctity as a meta dependent option. Most cEDH decks use similar wins at the moment like by abusing aetherflux, or walking ballista, etc. So it can be a cheeky include. Hey! I have some criticisms, and of course a deck to link below. For now I'll focus on cuts, but if you'd like I could also talk about cards to potentially add. Before we move on to specific cards, there's an overarching problem I'd like to address; the mana curve. You have next-to-no one drops, and you have SO many four+ mana plays! Try to get your curve down a touch. Butcher of Malakir, while good, is seven mana. 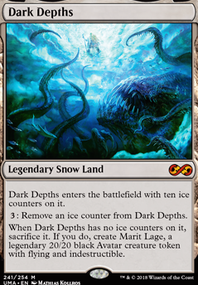 You only really need one Dictate of Erebos effect on the field, and if you're running this right, then you should absolutely be drawing enough cards to get to it quickly even if you only have two (DoE itself and Savra, Queen of the Golgari). Ghoulcaller Gisa is fine, but only if you have plenty of high-power creatures. 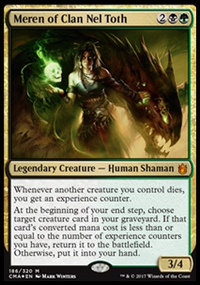 Your deck is only reanimating one creature per turn (which I'll talk about more if we get into inclusions) and it can be EITHER a large creature OR a utility creature, most of the time. Gonti, Lord of Luxury is nice, but as I have learned, 1) it's not really worth the cost if you also have to cast the card you choose, and 2) something about having their spells stolen really rubs people the wrong way. It tends to draw hate. Liliana, Heretical Healer Flip is slow and fragile. You don't really have creatures strong enough to defend against anything with either flying or trample. Mazirek, Kraul Death Priest is 1) going to die very quickly, and 2) not going to do a ton anyway. Do you wanna sac your creatures? If so then those counters are going to be strictly temporary and not enough to do a whoke ton. Midnight Reaper, if all goes well, will kill you. You will be sacrificing enough creatures that it will drain you out of the game. If all goes well, anyway. Mycoloth doesn't make it to your upkeep. Not only that, but once you drop something like that, people perceive you as a threat for the rest of the game. Pathbreaker Ibex is a great card, but it isn't going to do anything when you have like five creatures on the battlefield. Those five creatures, even with the boost, are still gonna be smaller than all your opponents'. Rune-Scarred Demon? There are better tutors at much less mana. Skullbriar, the Walking Grave is terrible in this deck. You have no way to put counters on it! Yeah, combat I guess, but that's not very effective. You'd be better served by Reassembling Skeleton, I think. The Gitrog Monster is drawing you one extra card a turn in exchange for a land. Sure you've got a lot of lands, but wouldn't you prefer Smothering Abomination or even Phyrexian Arena? Viridian Zealot's mana cost is really clunky and its ability is not that great. There are just better creatures who do the same thing. Borderland Ranger is usually better than Wood Elves. World Shaper is only good if The Gitrog Monster is also out. 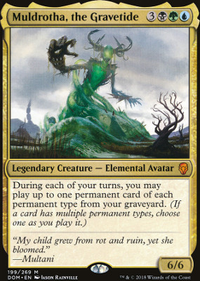 How many creatures are you attacking with per turn that makes Eldrazi Monument good?? Golgari Charm is not that great here. Greater Good is usually just discarding cards and drawing one or two cards. Priest of Titania. This card is seriously broken. Elvish Clancaller. While you won't be using the second ability, a 2-mana lord is always good. Joraga Treespeaker is an excellent mana dork. Wirewood Symbiote is also rather broken. Bounce your Elvish Visionary to untap your Priest of Titania, drawing more cards and making more mana? Yes please. Growing Rites of Itlimoc Flip. 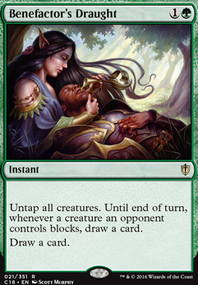 Gaea's Cradle is very expensive; this is significantly less so, but also very powerful. Wirewood Lodge. Opportunity cost is tiny, and can net you so much mana when it's useful. Nykthos, Shrine to Nyx. Same as above. Song of the Dryads. Mono-Green has problems dealing with creatures; this card would be basically unplayable in any other color, but is very good here. Craterhoof Behemoth just wins games. Triumph of the Hordes. Same as above. Regal Force can draw tons of cards. Krosan Grip is just powerful utility removal. Should be in every green deck IMO. Door of Destinies makes your 1/1s into serious threats. Heroic Intervention can protect your board from targeted removal and board wipes alike. Prism Ring is just bad. You don't have any lifegain synergies, and it's just not worth the card. Blunt the Assault is also just plain bad. I don't think you need Fog effects, but if you do, simple Fog is probably better. Nevinyrral's Disk. You have a lot of creatures, and usually don't want to be wiping the board. Krosan Restorer. Good mana dork, but not an elf. Llanowar Mentor. This card is cute, but not that powerful in practice. Might of the Masses. Combat tricks are usually pretty bad in Commander, and this one is no exception. Presence of Gond. Unless you're going infinite (which you're not), this card just doesn't do much. Elvish Pioneer is a bad mana dork. Leaf Gilder. Same as above. Elvish Soultiller. It would be one thing if this added them to your hand, but just shuffling cards into your library isn't that powerful. Viridian Zealot. There are better Naturalize effects. Hope this helps! Feel free to message me any time!